The much-loved Goldfish was one of the earliest fish ever to be domesticated. It is a small member of the carp family. The Goldfish pond saw its origin in the Tang Dynasty of China. 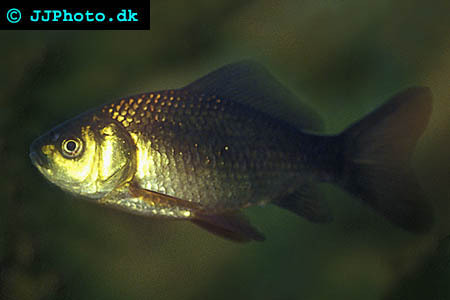 It was at this time that genetic mutation of carps produced the golden or the yellowy orange coloration on the carp. The Chinese emperor exclusively maintained the first Goldfish pond, a luxury that he denied his subjects. It was a symbol of royal splendor. Inbreeding and breeding in captivity led to more mutations. More striking colors led to the birth of the fancy Goldfish variety. Goldfish are natives of freshwater ponds or other slow moving water bodies. They need a pH between 6.0-8.0. The ideal temperature range for the Goldfish pond would be between 40-105 Degrees F. Goldfish is hardy fish generally, but do not survive long at higher temperatures. Goldfish need a lot of oxygen. In ponds, Goldfish will even survive lower temperatures so long as there is enough oxygen in the water. A thin layer of ice will also not affect the Goldfish in such a case. Goldfish are actually low maintenance, colorful and a rewarding addition to any pond. There are different varieties of gold fish that can be kept in the Goldfish pond. Although all Goldfish varieties can be kept in the Goldfish pond, some varieties are hardier than the others. The Comets, Ryukins and the Shubunkins are probably the best Goldfish for the Goldfish pond. The Comets have the distinction of being the only breed to originate in the USA. This variety has a narrow body, an orange or white body with a red head. A long training tail like that of a comet is what fetches the fish its name. Ryukins are round-bodied fish that are reddish orange or red and white. They have a very attractive butterfly like double tail. This variety is more popular in the Asian regions. The Shubunkins are most admired by the British. They are similar to the comets but have a shorter tail. They may be calico-colored, orange or even blue. Goldfish ponds are easier to maintain than many other kinds of fishponds. The average Goldfish does not grow too big, for one. Although its maximum length is 23 inches, it rarely grows beyond half this size. Goldfish do not eat plants. They may nibble a little at some vegetation, but generally leave plants alone. This makes them welcome additions to the outdoor garden pond. If the number of Goldfish that you keep in your Goldfish pond is relatively small, you will not need the elaborate and intricate filtration system that some other varieties like the Koi fish need. An air stone or small water pump that helps to circulate the water properly, especially in hot weather, is probably the only piece of equipment that a Goldfish pond needs. The low price of quality Goldfish and its abundant availability also makes them a household favorite. Juvenile goldfish of a type suitable for goldfish ponds. Goldfish are voracious eaters and can therefore produce large amounts of waste, both in the form of feces as well as secretions through their gills. Adding too many Goldfish to your gold fishpond will lead to the increase of wastes in your water. This will in turn trigger algae blooms. Excessive algae can kill fish. The water in the Goldfish pond should be treated before the fish are introduced. Chlorine, Ammonia and other water chemicals are dangerous to these fish. Plants like the water lettuce, sedges, waterlillies etc provide cover as well as foliage. Feeding Goldfish is another important part of the upkeep of your Goldfish pond. Feed them with food pellets. They should only be given as mush feed as they can eat in the first 5 minutes. Anything more than this will only putrefy in the water and thus make it impure. Herons, raccoons, cats etc can make a tasty meal of the Goldfish. So, outside cover is necessary for the Goldfish pond. One great advantage of the Goldfish pond is that during periods when the water becomes too chilly, the fish can easily be transported indoors and kept at home.